I recently gave birth to my son and Green at Heart’s first little green warrior. I was privileged enough to be thrown a very special baby shower and was so touched that the entire event was aimed at being eco-friendly. There were no straws or balloons and the décor was cleverly thought out to minimise waste. Although they are joyous occasions, parties can be incredibly wasteful. When it comes to planning them most of us tend to get caught up in all the prettiness and just land up worrying about how everything will look rather than how much waste we will generate. We forget that once the event is over the invitation and so much of the décor is simply thrown away. 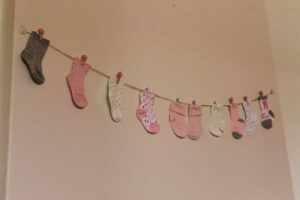 Feeling inspired by the innovative and simple yet effective ideas from my eco-friendly baby shower, I thought I would share some of those ideas and give our readers a few other party planning tips, in the hope that others could also be encouraged to host greener events, showers and parties. Get creative and make a stylish and cleverly worded invite that can be sent electronically to avoid wasting paper. 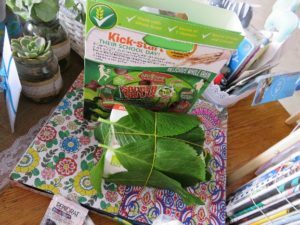 You can even tell your guests ahead that the party will be an eco-friendly one, to get them more involved. Host the event outside or at an attractive venue and thereby reduce the need for lots of decorations (i.e. streamers and balloons). Minimise the amount of waste generated by avoiding balloons, paper serviettes, straws and single use disposable items, especially polystyrene cups. If you must use disposable cutlery and tableware, then try and rather use paper or biodegradable/compostable items. In terms of décor, think of decorations that can be reused or that have a multi-purpose, for example, be used as decorations at the party and then also have a purpose after the event. 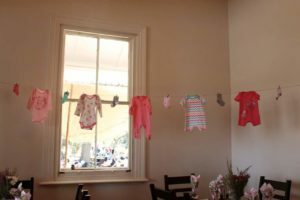 For example, babygrows and baby socks on a string make for a very sweet and eye-catching décor piece at a baby shower. 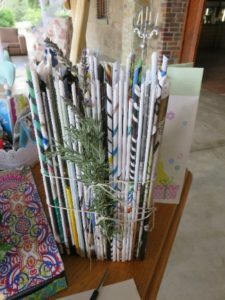 Get crafty and make your own decorations from recycled/upcycled items. Flowers or greenery in recycled jars can make for attractive centre pieces. Fairy lights and fabric bunting can be reused at many events and always look festive and pretty. Recycle any waste generated at the event. 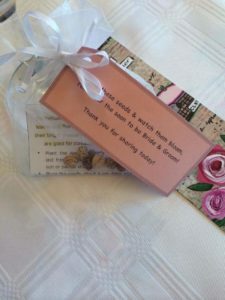 If you are giving thank you gifts to your guests, try and come up with something that will not just be thrown away after the party. 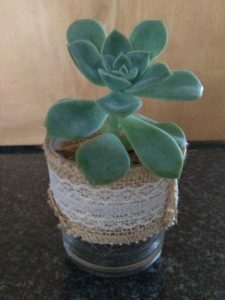 For example, a small pot plant using succulents harvested from the garden, seeds that your guests can plant, or homemade cookies can make for thoughtful gifts. You could choose to rather not receive gifts and ask your guests to donate to a charity or a worthy cause. Such information can be included in the invitation. 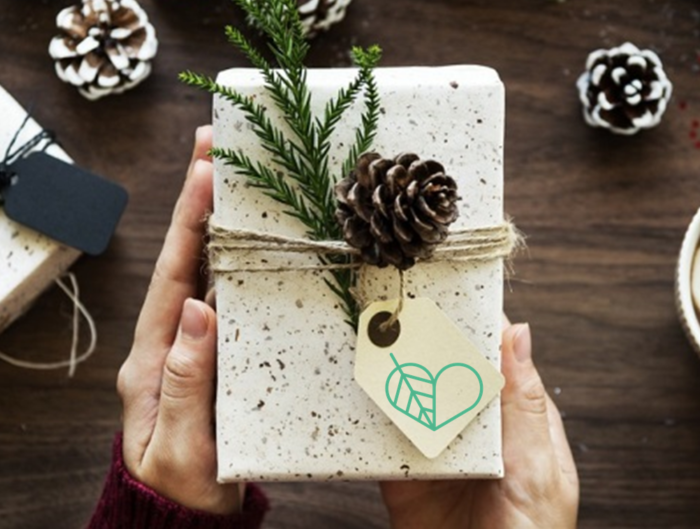 For a baby shower or party that has a gift registry you can encourage people to bring gifts that are appropriate to the eco-friendly theme with a “green gift registry”. For example, I am using cloth nappies and earth friendly products for my little one, so this information was included as part of the gift registry on the invitation. You can always take a look at Faithful to Nature or purchase brands that are earth friendly such as Pure Beginnings, which is sold at Dischem, Babies R Us and Baby City. Green is in, blue is out, protecting our earth is what we are all about. Forget the wrapping paper, it’s time to be more environmentally friendly. Let’s rather use a blanket, a basket or reusable bag for your gift. A prize will be given for the most creative and eco-friendly wrapped gift. 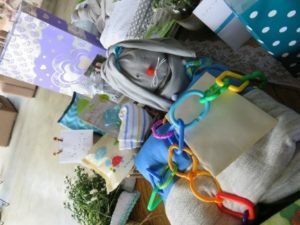 Here are some of the ways guests “wrapped” their gifts- my favourite wrapping ideas included cereal boxes, leaves, rolled up pages from a magazine used to decorate a box, homemade wrapping paper, blankets and baskets that could then be used in the baby’s room. Step away from conventional mindsets and think outside of the box, it’s your eco-friendly event so be creative, get those green inspirations flowing and have fun making your party one to remember and at the same time an event that has a reduced impact on the environment.